Northanger Abbey tells the story of a young girl, Catherine Morland who leaves her sheltered, rural home to enter the busy, sophisticated world of Bath in the late 1790s. 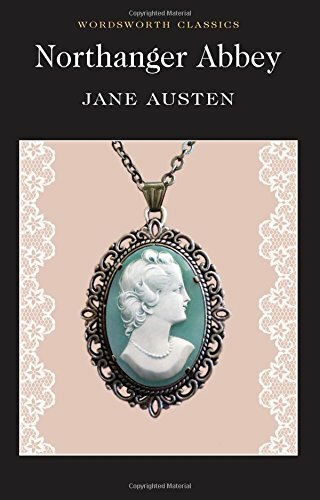 Austen observes with insight and humour the interaction between Catherine and the various characters whom she meets there, and tracks her growing understanding of the world about her. 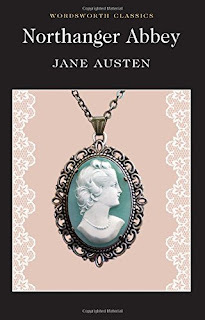 In this, her first full-length novel, Austen also fixes her sharp, ironic gaze on other kinds of contemporary novel, especially the Gothic school made famous by Ann Radcliffe. Catherine's reading becomes intertwined with her social and romantic adventures, adding to the uncertainties and embarrassments she must undergo before finding happiness. I really really wanted to love Northanger Abbey but I really really didn't. It simply couldn't hold my interest for more than a few pages and I found the characters so one-dimensional that I forgot them as soon as their sentence ended. Catherine was an ok character; the benefit for me being that she was clearly the main protagonist so I knew to take notice of her. I only felt that she endeared herself to me in the second half of the book, though. I did enjoy Catherine looking around her room in Northanger Abbey and being a bit nosy but that's the only occasion I could describe it as humorous. I think Northanger Abbey must be for die-hard Jane Austen fans as I really couldn't see the appeal. Sorry Austen fans, this one wasn't for me. 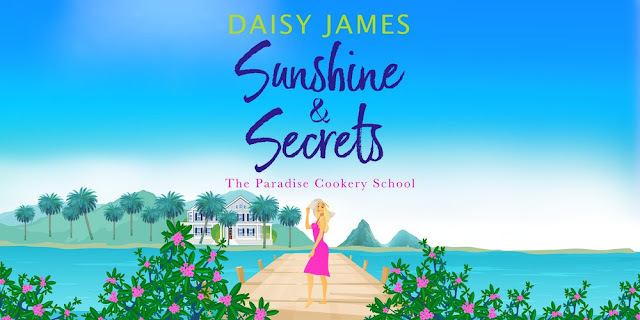 At long last, I've read my first (but definitely not last) Daisy James book. If ever a book should be read on holiday, it is Sunshine and Secrets but for those of us who don't have sun-friendly skin it's a perfect getaway to distant lands we can only dream of from the comfort of our favourite armchair. Amelia (known as Millie) Harper has just the right thing to take her mind off her broken heart: an opportunity to set up The Paradise Cookery School on the Caribbean island of St Lucia. 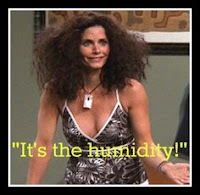 As if Millie's wet welcome to St Lucia wasn't funny enough, her drenching leaves her with big hair akin to Monica Geller when the Friends go to Barbados. Picturing Millie like that was enough to get me sniggering like a schoolgirl. As well as trying out gorgeous recipes, Millie has to try to get the local laid-back workmen to stick to their schedule, which is easier said than done with the sun blazing down and the ripples of the swimming pool causing a temptation that's impossible to resist. Local cook, Ella, and Estate Manager, Zach, are on hand to help Millie and, after a stand-offish start with Zach, Millie finds her pulse racing - Zach could be the perfect cure for her broken heart. What really surprised me about Sunshine and Secrets was the added mystery of the disappearing cocoa pods. 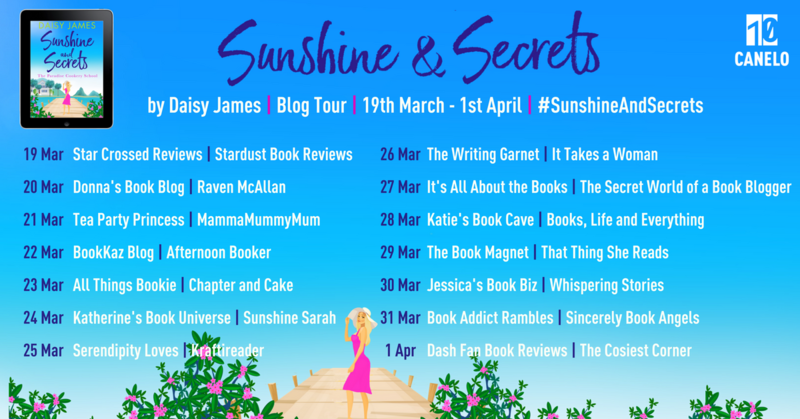 Rather than succumb to the easy-going pace of the Caribbean vibe, it made me look at the characters a little more closely as I tried to gather clues. Sunshine and Secrets is so full of sunshine that I needed my Factor 50 on just to read it. I felt as if I was on St Lucia with Millie, sitting drinking an Andy's Blast cocktail in the beachside Purple Parrot cocktail bar. Naturally, I didn't want to leave, although in real life I would have been burnt to a crisp! 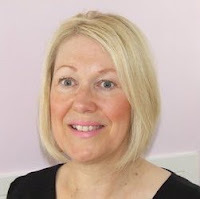 Daisy James is a Yorkshire girl transplanted to the north east of England. She loves writing stories with strong heroines and swift-flowing plotlines. When not scribbling away in her summerhouse, she spends her time sifting flour and sprinkling sugar and edible glitter. She loves gossiping with friends over a glass of something pink and fizzy or indulging in a spot of afternoon tea - china plates and teacups are a must. But it's as though every day, every minute even, she knows them a little less. Her boys aren’t boys anymore, they’re becoming men - men she’s not sure she recognises, men she’s not sure she can trust. So when one of her son’s classmates is killed in suspicious circumstances, people start asking questions. Was it really a hit and run? A car-jacking gone wrong? Or something much more sinister? Now Jackie must separate the truth from the lies. How did that boy end up on the road? And where was her son that night? I didn't plan to read If I Die Tonight in one sitting, but once I started it, I simply couldn't put it down. The prologue hooked me immediately with a Facebook post from 17 year old Wade that tells the reader 'By the time you read this, I'll be dead.' This suicide post was so sad and heartfelt that I just had to devour every single page to find out how Wade was left feeling this way. Wade's post mentioned 'memory gifts' and I thought that was such a beautiful way to refer to a special memory. One that we treasure so much that we wrap it up, tie it with a ribbon and store it in a special part of our brain until we're feeling low and need to unwrap the gift to rediscover our happy feelings from that time. I'm going to remember that description (no pun intended). Wade's schoolfriend, Liam Miller, was killed in an apparent car-jacking. The only witness is the car's owner: a has-been rock star, Aimee-En, who seems to be hiding something. Wade is also acting suspiciously and it's noticed by his Mom, Jackie and younger brother, Connor. When Wade can't account for his whereabouts on the night Liam was killed, even Jackie starts to think that Wade might be guilty. Mob mentality goes into overdrive when the townsfolk pick up on Wade's lack of alibi and they delight in finding someone to blame. The reader is a little more forgiving as they are allowed to piece together all of the pieces of the puzzle before the truth is revealed. I found it so interesting to see how easily people jump to conclusions. I'm not saying I'm never guilty of this, but most of the time I do tend to look for all of the facts before making a decision - it's probably because I have read so many crime books! The book also highlighted the effects of social media and how people can be so vicious when hiding behind a screen. 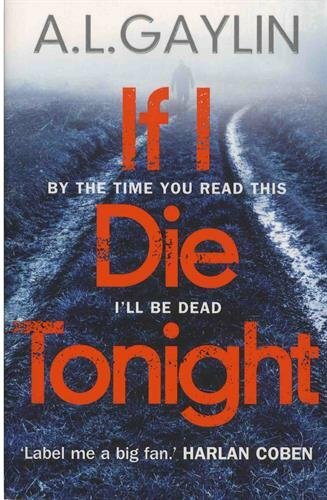 There are a lot of characters in If I Die Tonight so I sometimes found it confusing and didn't know who was who. I picked up the main characters easily enough but sometimes had to flick back over the pages when a minor character reappeared. That's the only real criticism I had but it's what makes this addictive and suspenseful book a four star rather than a five star read for me. Experimental psychology burst onto the intellectual scene in the middle part of the nineteenth century, radically transforming the way we understand human thought and behavior. 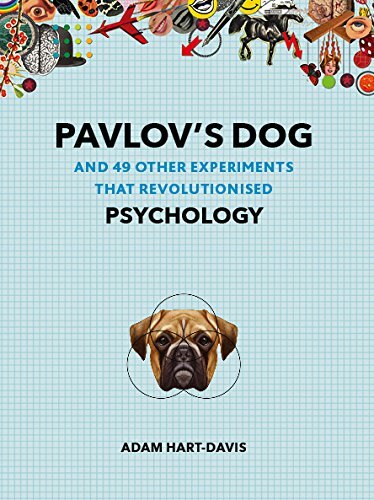 Featuring clear explanations and first-rate scholarship, Pavlov’s Dog introduces the reader to iconic experiments, including Pavlov’s salivating dogs, Bandura’s Bobo doll experiments, Milgram’s obedience studies and Zimbardo’s classic Stanford prison experiment. 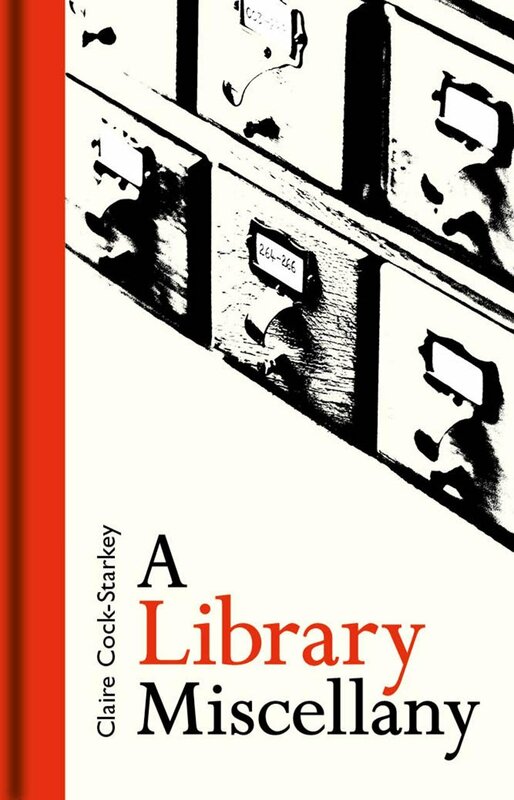 In each case, context, procedure, results and implications are carefully considered, allowing the reader to gain a strong sense of psychology as a living, breathing endeavour. I just have to say first that I love the graph paper cover; it made me want to get out my pencil and ruler and plot some charts! I also love the funky images that you can see at the top of the cover, they are replicated throughout the book and reminded me of Monty Python's Flying Circus. The cover actually says a lot about the style of the book: it's science made fun by Adam Hart-Davis. I've always had a keen interest in psychology and I think there's nothing more interesting than finding out how the human mind works. I hadn't heard of Pavlov's Dog before reading the book but that is only one of the many amazing experiments that Adam Hart-Davis describes in bite-sized pieces. The book is written in chronological order with experiments grouped into six parts so you can see how psychology has evolved throughout the ages. I not only found myself intrigued by the experiments, but I saw myself in so many of them. Anyone who knows me will have heard me mentioning space invaders at one time or another. No, not the video game but those people who stand TOO CLOSE! Felipe and Sommer studied invasions into personal space in their 1966 experiment so I'm glad to see that I'm not alone in 'moving along the bench' when my space is invaded. Another experiment that intrigued me was the peer pressure test conducted by Asch in 1956. I remember going on a management course not long after I had read a psychology book (for fun, as you do). The trainer conducted an experiment whereby he stated three facts about himself and asked the group which one was a lie. The group's answers were split between two of the facts, whereas I was the only person who chose the fact that was actually the lie. The psychology book I read had told me how to identify a lie but the point is that mine was the only answer that differed to the whole group. Perhaps some of my colleagues agreed with my choice, but succumbed to peer pressure and went with the majority as Asch's study concluded. So if you've ever wondered why you can't tickle yourself or wanted to know how you can hear with your eyes, this is the book for you. It's a fascinating introduction to psychology for those new to the science, but also a fantastic reference guide to the main experiments that have shaped psychology into the science we know today. What an introduction to a new crime series! I loved every single word that Malcolm Hollingdrake has carefully chosen in this first instalment of the DCI Bennett series. The writing is so descriptive that a picture is painted before your eyes as if you're watching it on screen, which DCI Bennett can't do as he doesn't have a television, or an 'Idiot's lantern' as he calls them. It didn't take long for me to feel an affinity with DCI Cyril Bennett. 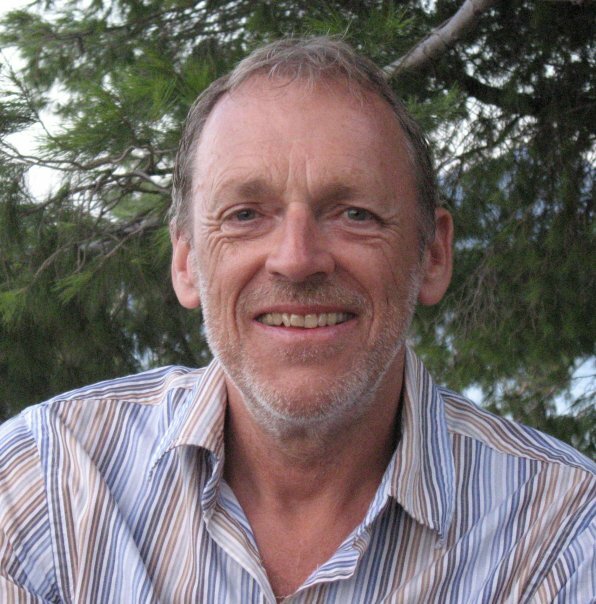 He's a typical Northerner, who loves a pint of Black Sheep (my favourite beer), is thought of so highly by his colleagues that he has a humorous nickname and is getting on with his job despite suffering from an outbreak of Bell's Palsy, causing temporary paralysis to his face. Partnered with young and naïve DS David Owen, the pair investigate when two infant bodies are found. At the same time, a killer is targeting care workers by infecting them with sulphur mustard, harvested from bullets left behind during the First World War. Bennett has his hands full with both cases but I had no doubt that his good old-fashioned police work would reap rewards. I read Only the Dead just before the awful events in Salisbury where nerve gas was used on a former Russian spy and his daughter. The real life events had little care for who would get infected by the toxin, whereas the perpetrator in the book was a killer with a conscience as he warned the targets to contain themselves to avoid innocent people being infected. Without delving too deeply, it also brought to light some of the conditions that our elderly population have to suffer in care homes. I know we only hear of bad stories, but I do hope that there are more good care homes out there than bad ones. 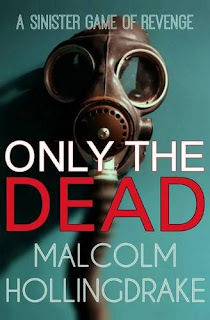 Although it's only a 254 page book, Only the Dead epitomises the saying 'quality over quantity' and, with not a word out of place, shows the rest of the field how a book should be written. I'm really looking forward to continuing the series with Hell's Gate. 18 months after the 'Ragdoll' murders, a body is found hanging from Brooklyn Bridge, the word 'BAIT' carved into the chest. In London a copycat killer strikes, branded with the word 'PUPPET', forcing DCI Emily Baxter into an uneasy partnership with the detectives on the case, Special Agents Rouche and Curtis. 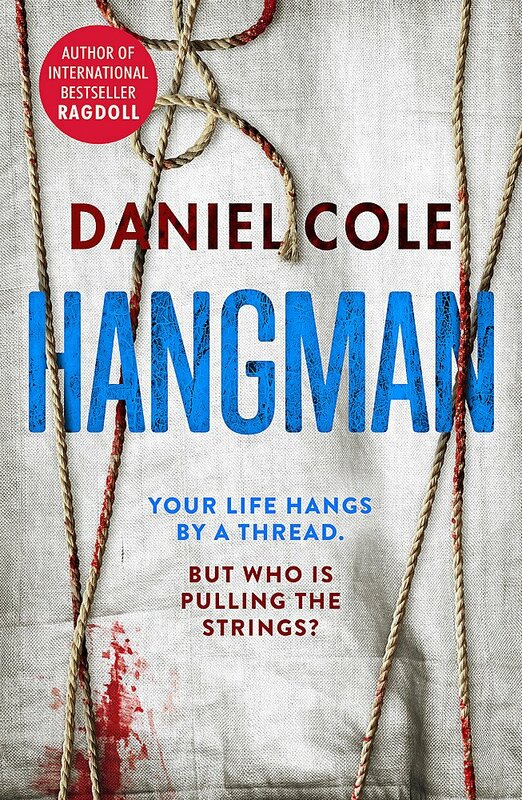 This book should come with a defibrillator; my heart nearly stopped when I was reading Chapter 1, then it was put through its paces to see how fast it could beat as I raced through Hangman, the new book from Daniel Cole. Having read Daniel Cole's amazing debut, Ragdoll, I was keen to see how the next book in the series would compete. It didn't just compete, it rewrote the rules of the competition! The main thing I noticed about Hangman, was the absence of William Fawkes, known as Wolf. Hold on a moment, how could this be the second book in the Detective William Fawkes series when Fawkes wasn't really in it? As much as his absence was noted, I have to say that it wasn't really missed as DCI Emily Baxter is such a brilliant character. She's prickly and distant but a damn fine policewoman; she's not there to be liked, she's there to do a good job and I love that about her. I really enjoyed the dual location of London and New York. One thing that Daniel Cole has really mastered in his writing is creating such vivid visual displays from his impeccable descriptions. You really do feel as if you are there or at least watching it on tv rather than reading a book. Due to the nature of the crimes, this does sometimes make it uncomfortable reading but blood spatter and twisted villains is what you would expect in such dark, gripping crime fiction. Leading nicely on to book 3 (yay), Hangman satisfied the craving for crime left by Ragdoll, but definitely left me thirsty for more. I'm not squeamish about many things but I strangely enough don't like piercing skin and although this features in both books it wasn't my skin so I was fine with it (clearly, I'm more selfish than I thought). 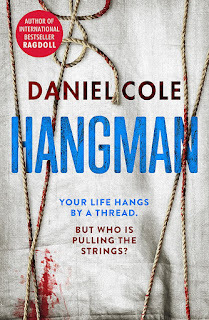 Don't let this put you off at all, this is just my strange foible and although Hangman is not for the faint-hearted or squeamish, it is without doubt a book (and a series) I would highly recommend. 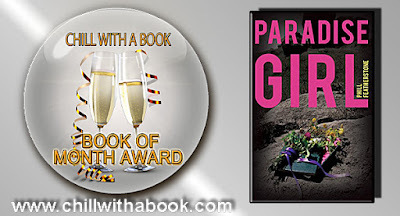 I was more than happy to help out on the Paradise Girl blog blitz. I think the book sounds great but alas I couldn't fit it into my reading schedule. Even so, I'm thrilled to bring you an extract and a giveaway to win an ebook. First, let's see what Paradise Girl is all about. Sounds great, doesn't it? Here's a little extract to whet your appetite. When Sarah rescues a young girl in trouble, she expects nothing in return. But her act of bravery puts a powerful and dangerous man in her debt. He lives by his own brutal code, and all debts must be repaid - in the only way he knows how. Having read and loved T.M. 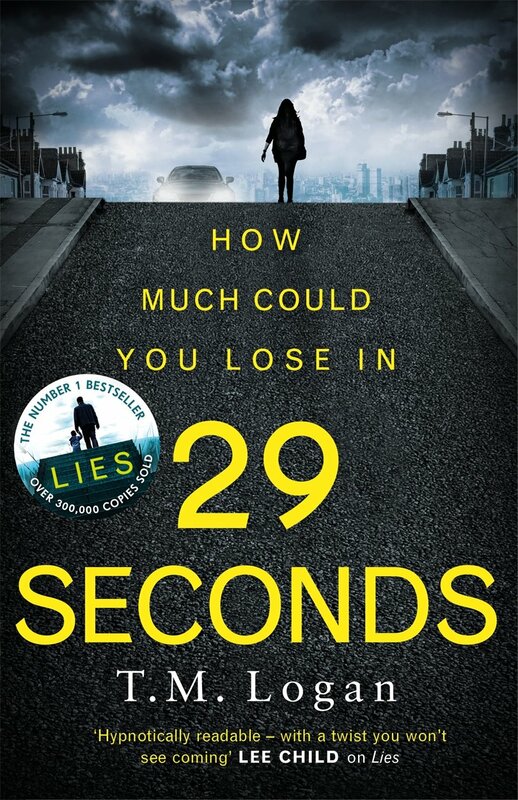 Logan's debut, Lies, to say I was keen to read his new book, 29 Seconds, was an understatement. I read 29 Seconds through The PigeonHole with a few chapters being released every day over a period of 10 days. 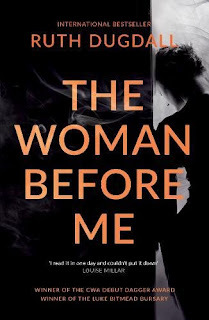 As difficult as it is to wait 24 hours for your next book fix, it's amazing how much you look forward to reading it and the tension and suspense feels heightened as the book nears its conclusion. Sarah's boss, Alan Lovelock, is a sexual predator; everyone knows it but nobody seems to be able to do anything about it. He's highly thought of by the university and seems to be able to do no wrong which is how he gets away with his inappropriate behaviour. When Sarah finds herself in Alan's crosshairs it was like she was a fly caught in a spider's web with no means of escape until a strange event gave her a way out. When Sarah witnesses a weird accident that looks like a kidnapping attempt on a young girl, the girl's Russian father offers to thank Sarah by making someone disappear. In a call lasting 29 seconds, the name she gives is Alan Lovelock but when guilt causes her to regret her decision, is it already too late? Every attempt to show Lovelock's true colours seems to backfire and Sarah is running out of options and time. Is that an excuse to end a man's life, though? I was so angry that Lovelock was protected at work, it was like an old boy's club where they had each other's backs. I wondered whether his colleagues believed his lies or just chose not to see the truth. How many of us would stand up for someone else or just ignore it and feel grateful that it wasn't happening to us? 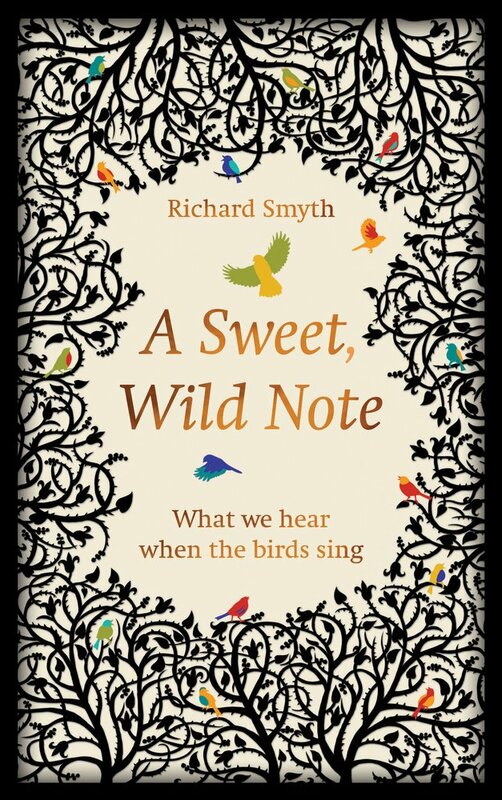 If ever a book has you constantly wondering 'what would you do', this is it. I think everybody who reads it will ask themselves this same question. 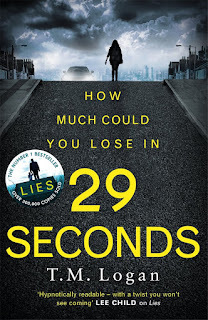 A completely gripping and highly addictive book, 29 Seconds is another cracking page turner from T.M. Logan. 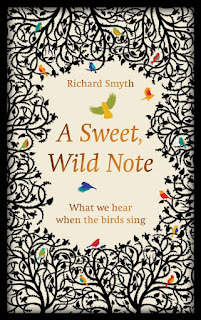 I don't often refer to the cover of a book but just take another look at this one - now that's what I call delicious! 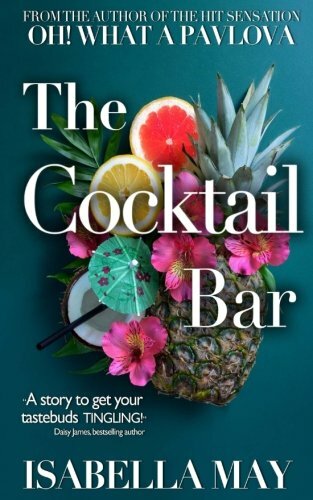 The cocktails inside are as mouthwatering as the cover but they have an added sprinkling of magical fairy dust thanks to a secret cocktail ingredient: the Mexican elixir. River Jackson is one messed up guy. He's left his band and returned home to Glastonbury to open a bar where he wasn't exactly welcomed with open arms. Some of his old schoolfriends let him know that he is not welcome back by smashing up his new trendy cocktail bar. As if his life couldn't get any more complicated, he is then seduced by Georgina who is the sister of Blake, the bar-smashing ringleader. I was so exasperated with him, saying 'River, River, River think with your head for a change...' but Georgina puts on a good show until she turns into psycho-b*tch and River only has himself to blame. When Alice also leaves the band and returns to Glastonbury, the real sparks fly as you can tell that she is meant to be with River. Georgina isn't rolling over without a fight though and she starts to sharpen her claws as Alice threatens to ruin her masterplan. There was so much going on with the complicated relationships that I often forgot about magical elixir storyline. Alcohol is often referred to as magic potion, but in The Cocktail Bar River really does have a magical ingredient. On a trip to Tequila he meets the mysterious Mercedes who gives him a bottle of her magical elixir to be given to three chosen people who will identify themselves to River. I loved seeing who was going to choose the magical cocktail and what would happen to them when they did. It just shows that if you believe in magic, anything can happen. 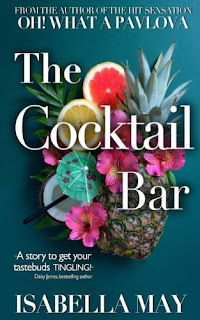 The Cocktail Bar is a mouthwateringly delicious book filled with drama and a sprinkling of magic. Now, having spent nearly five years behind bars, Rose is just weeks away from freedom. Her probation officer Cate must decide whether Rose is remorseful for Luke's death, or whether she remains a threat to society. As Cate is drawn in, she begins to doubt her own judgement. ...and the creepiest Opening Chapter award goes to Ruth Dugdall for The Woman Before Me! This opening chapter made my skin crawl as one of my fears and one of my foibles were brought together. I don't like to think people are watching me without me knowing and I have a fear of a stranger entering my bedroom (and killing me) when I am asleep. So when Rose stands over Emma watching her sleep, I really did gasp out loud and that was only the tip of the iceberg! Rose is arrested for starting a fire that night in Emma's house where Emma's baby son died and Emma claims to have been alone in the house, but Rose knows that she wasn't. Rose keeps this information to herself and accepts her fate, which I think has a lot to do with the post traumatic stress from which she is suffering after the death of her premature baby, Joel. Rose lost her mother at a young age and doesn't know how to be a mother herself, but she doesn't even get the chance so it was no surprise to see her latch on to Emma and her baby, Luke. Emma is only too glad of the help as she leaves Luke with Rose so she can have some time to herself. It would be easy to blame Emma, and in a way I did, as she used Rose for free babysitting services but she probably thought that Rose was her friend, despite knowing nothing about her and not caring enough to find out. Now Rose is up for parole and Probation Officer, Cate Austin must decide whether Rose should be released or not. As Cate digs into Rose's disturbing past she, like all of us readers, wants to know whether Rose was indeed guilty of starting the fire that night. I was constantly questioning this but then came up with another conundrum: if Rose didn't start the fire, who did? And if she didn't do it, why did she accept her prison sentence so easily? 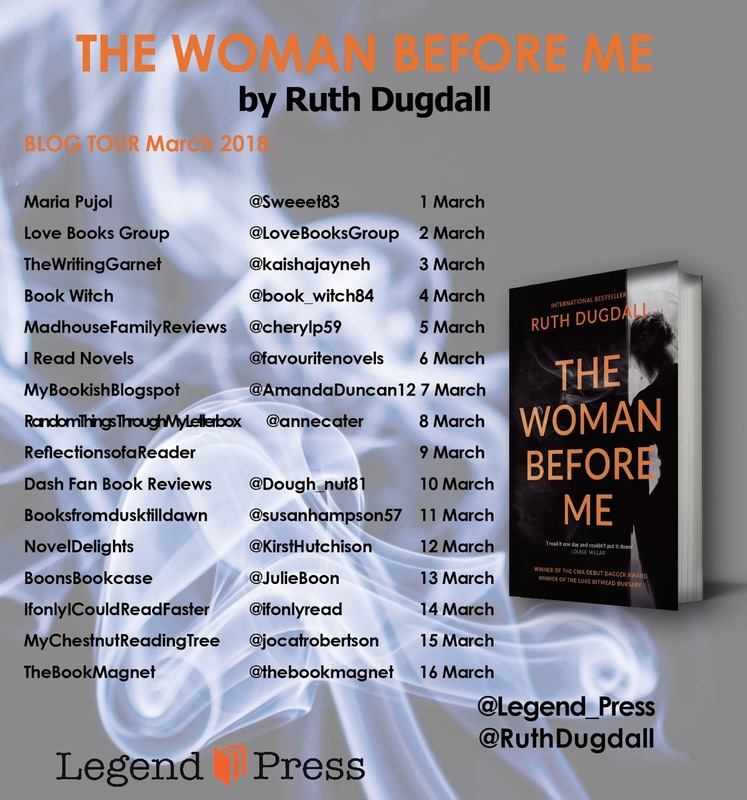 I am not surprised that Ruth Dugdall won the CWA Debut Dagger Award in 2005 for The Woman Before Me. 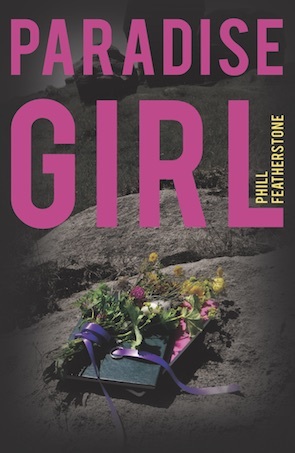 It is a gripping, skin-crawling, dark, psychological thriller that I didn't want to put down. It is so intriguing that I felt as if I read it too quickly, as I needed to find out the whole story as fast as I could, so it's a good excuse to read it again to savour every detail of this dark and delicious domestic noir book. Disturbing, gripping and highly recommended.